The beauty of campus is shown in this walkway leading to the Ruane Center for the Humanities. 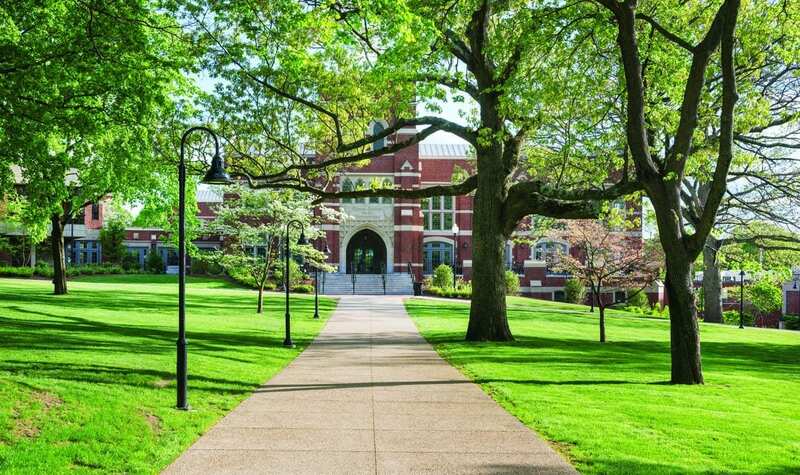 Providence College’s 105-acre campus is home to more than 1,400 trees in 82 species. Since 2011, each has been categorized by size, age, condition, structure, health, and vigor, and marked with a blue identification tag. There are white oaks and black oaks, spruce, dogwood, pear, lilac, mulberry, plum, crabapple, and 50 kinds of maple trees. Some of the trees were acquired through the College’s purchase of the Bradley estate (Martin Hall) in 1926 and the Bailey Estate (Dominic House) in 1955, including a European copper beech that stands near Meagher Hall. Another rare tree is the Dawn Redwood, a kind of sequoia, contributed by Dr. C.B. Wood, professor emeritus of biology. It stands near the Ruane bioswale outside the Science Complex. A paleontologist, Wood encountered the Dawn Redwood through specimens at the Arnold Arboretum in Boston, where the trees were grown for the first time in the United States. Students enjoy a springtime walk beneath the cherry blossoms. Martin Hall is at right. 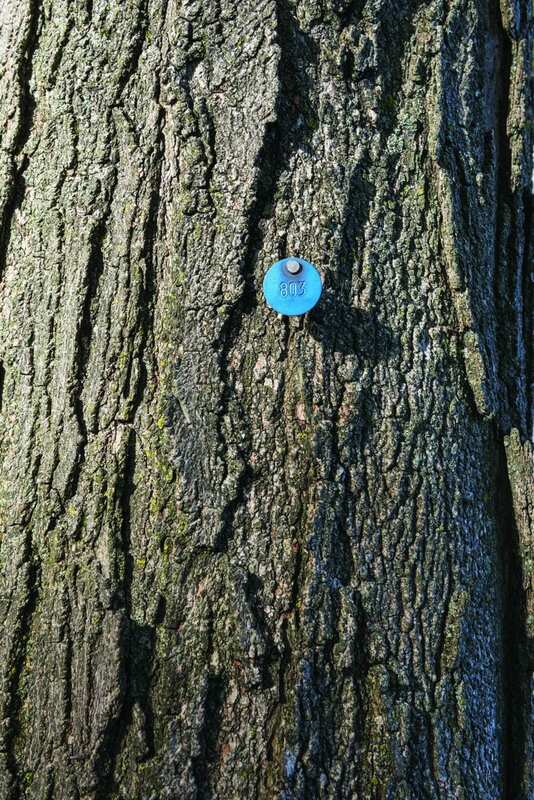 A blue tag indicates a tree’s place in the campus tree inventory.